There's so many fabulous family festive activities in the North East at this time of year, but it can soon start to add up, and make a big dent in the Christmas budget. 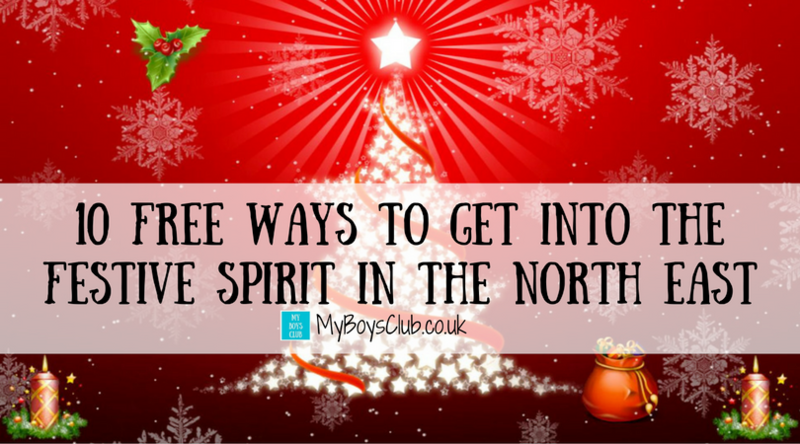 So with just over two weeks left until the big day, here are our top ten FREE ways to get into the Festive Spirit this Christmas in North East England. 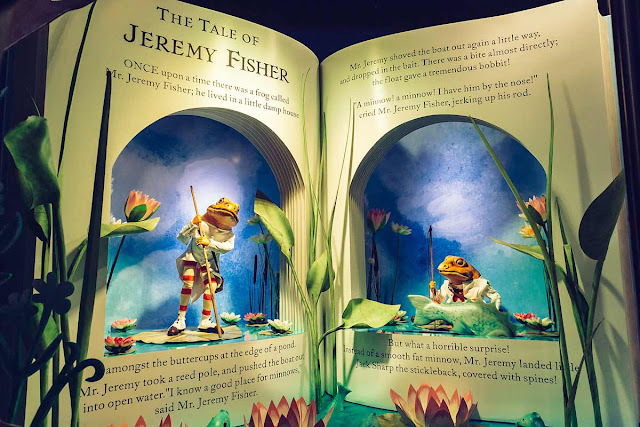 Take a stroll up Northumberland Street in Newcastle to view the annual amazing spectacle of Fenwicks Windows. Available to be enjoyed daily from 8am to 10pm until the New Year. Combine it with a visit to see Santa if you’ve been lucky enough to book a slot, if not make time to see the fabulous Christmas Department. One of my faves. It is such a tradition that it even as a free event it makes it into Life In Geordieland's Top 15 things to do before Christmas. Raby Castle has a Taste of Teesdale this Christmas with a seasonal outdoor market, organised by Barnard Castle Farmers Market, with a hand-picked selection of stalls offering food & drink ideas from around the region. Pick up your real Raby Estates Christmas tree while you're there too! 11am – 4pm. Please note Raby Castle & gardens will remain closed. Celebrate the joy of Christmas with charity Crisis who will be welcoming visitors at their annual carol service. Beautiful hymns will be sung by the Cathedral Choir and the work of Crisis will also be celebrated. The carol service is free and there will be a collection in aid of Crisis and the work they do. Doors open at 6pm and there’ll be mince pies and hot chocolate available. The intu Metrocentre’s free Santa Grotto offers a treat for all good North East girls and boys this festive season until December 24. Every child who visits Santa and his elves at the free Grotto, situated in the lower Qube, Yellow Mall, underneath the giant Christmas tree, receives a free gift. Samantha from North East Family Fun recently took her family to see the intu Metrocentre Santa read about their experience here. 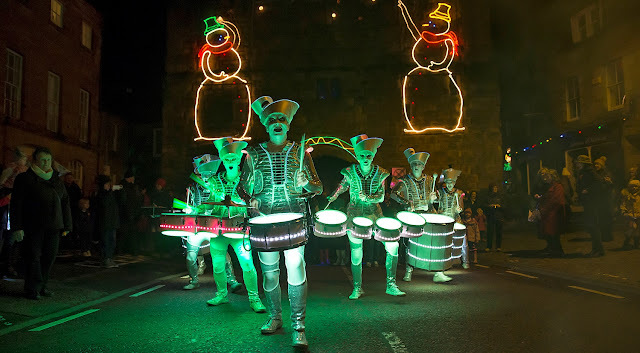 This is a festive weekend of traditional Christmas street performers and walkabout acts adding live entertainment to the streets of Durham City, which promises to be a great family-friendly event! Why not head to Palace Green Library too for a drop in Christmas Card sessions between 1pm and 3pm both days. Enjoy the Christmassy sounds of Sage Gateshead’s very own ‘Elf Band’ during these festive and very fun concourse performances, taking place on December 10-11, 17-18, and 21-24 at 11am, 12pm, 1pm and 2pm. At the Shipley Art Gallery, you can craft a Christmas card at drop-in sessions between 10am – 5pm on the 10th. Or why not try Christmas wrapping and card printing at South Shields Museum and Art Gallery between 12.30pm – 3pm. Led by ‘Spark’, this promises to be a magical evening featuring live music, light and movement. The procession will make its way through The Alnwick Garden in Northumberland - starting at the main car park - and into Alnwick town centre creating a spectacular visual feast for visitors. The parade will start at 5.15pm on December 18 and will last until 6.30pm. Enjoy a traditional Festival of Nine Lessons and Carols which always starts in darkness with a solo chorister singing the first verse of Once in Royal David’s City. These services are a highlight of the Advent and Christmas season and are very popular services, so you are advised to arrive in good time. Starts 7pm on 22nd and 3pm on the 24th. And if that's not enough you can always amble the streets of our many lovely market towns and city's taking in the Christmas lights, or get away from it all with a festive walk along the coast or across the countryside! Are there more free events I should add to this list? I know. There are so many festive events that charge - they are great but it all adds up. And I've found that the amount you pay doesn't equate to what the kids think either. Sometimes the free ones are the best.